Office printers are generally the ideal devices for small to medium sized workgroups, who only need print functionality, as opposed to copy, scan or fax. These work groups only really need relatively small devices with medium print speeds of around 20 to 35ppm, designed to meet the demands of a small, relatively busy office. 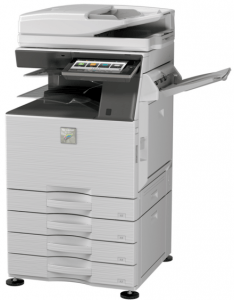 Office printers can also be used to support large corporate offices. Large office printers are designed for environments where users print hundreds, if not thousands of prints per day. Rather than being desktop based, office printers tend to be floor-standing, allowing for more paper to be stored within the paper trays. Most office printers are able to support paper up to A3 sized, which can be helpful for businesses who need to print off large diagrams, spreadsheets or posters. Midshire supply a wide range of office printers from small desktop mono devices right up to large colour A3 printers, from leading manufacturers, including: Ricoh, RISO, HP and Lexmark. Does my office need an ink-jet printer or laser printer? There are two main options to distinguish between when looking for a new printer, and it is to do with the technology that makes the printer work. Ink-jet printers are traditionally what is seen in the home office, they have print-heads that spray the ink onto the paper to produce the print-out. These can be cheap to purchase, but tend to be more expensive to run, as ink is a costly commodity. Home office ink-jet printing can some time be messy with paper being soaked wet with ink and taking a long time to dry. Laser printers have dominated the office printer market for decades. Instead of ink, they use toner. Toner is a dry powder that is applied to the paper and heated to ensure it fuses to the paper. Laser printers tend to have higher page per minute speeds, simply because of the printing process. However, there are a couple of brands of printers which go against the trend. RISO printers use inkjet technology and are the fastest on the market, producing up to 150ppm print speeds. 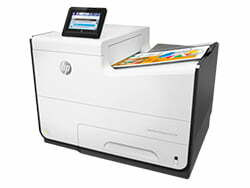 Additionally, the new HP PageWide technology produces print speeds of 70ppm in a small desktop ink-jet device which is unheard of in the print industry! 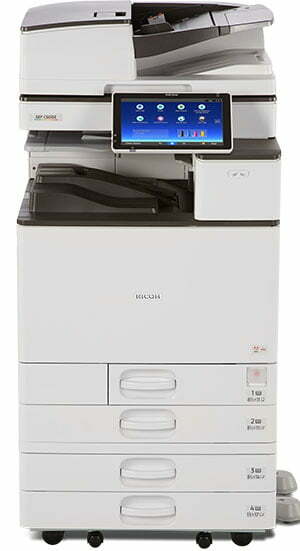 Ricoh also recently introduced a new range of office printers, which utilise GelJet technology. Rather than using traditional toner, GelJet is water insoluble and dries on contact with the paper, meaning its prints are waterproof. While cartridges for laser printers may be more expensive than inkjet cartridges, they have a higher yield and so are able to print more copies than inkjet cartridges, making them a more economical option. The cost of ink cartridges is well known for being expensive, in some instances dearer than gold and champagne. By choosing the Managed Print Service route, you can help keep the cost of printing down, with all toner and ink included in an agreed cost-per-copy charge, whilst ensuring your business is receiving service and support on the device. The majority of medium to large businesses today require their printing devices to do more than simply print. Instead, they want their one device to scan, copy, fax and distribute electronic copies of files as well as simply print. This is where the all-in-one or multifunction printers (also known as all-in-one printers) comes in. Multifunction printers are an integral piece of equipment for the majority of offices throughout the UK. 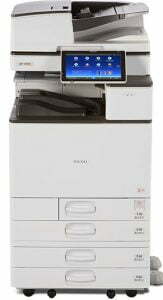 As well as offering the additional scan, copy and fax functionality, multifunction printers can have additional finishing options added, such as stapling, booklet making, hole-punching and sorting, making administration tasks as easy as a touch of a button and reducing the labour required from office staff! Large office printers, or light production printers are often best suited to reprographics or marketing departments. They are able to handle large print runs due to their high print speed and large paper trays and can accommodate more advanced features and finishing options to produce a variety of printed output on a wide range of paper sizes, types and weights. Large office printers can remove the need for companies to outsource some of their printing to a commercial printer. 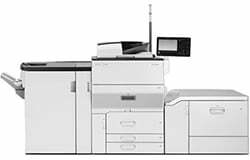 Midshire is able to supply and service Ricoh and Sharp light production printers. Office printers can be purchased outright or financed via a lease. The majority of businesses throughout the UK lease their printers, typically for 3 to 5 years. Leasing is a tax efficient way of financing office printing equipment. By leasing your equipment, you avoid the large upfront costs of purchasing, and often businesses find they are able to afford a better machine than they initially expected. Midshire offers a Managed Print Service contract to all our customers, irrespective of device type or size. A Managed Print Service is a comprehensive service agreement that covers everything, from the installation of the machine and operator training, right through to general and preventative maintenance, a 4-hour targeted engineer response to any emergency calls, as well as all toner cartridges required and automatic meter readings collected using our machine monitoring software – OneStop.